How to make homemade peanut butter eggs healthy! 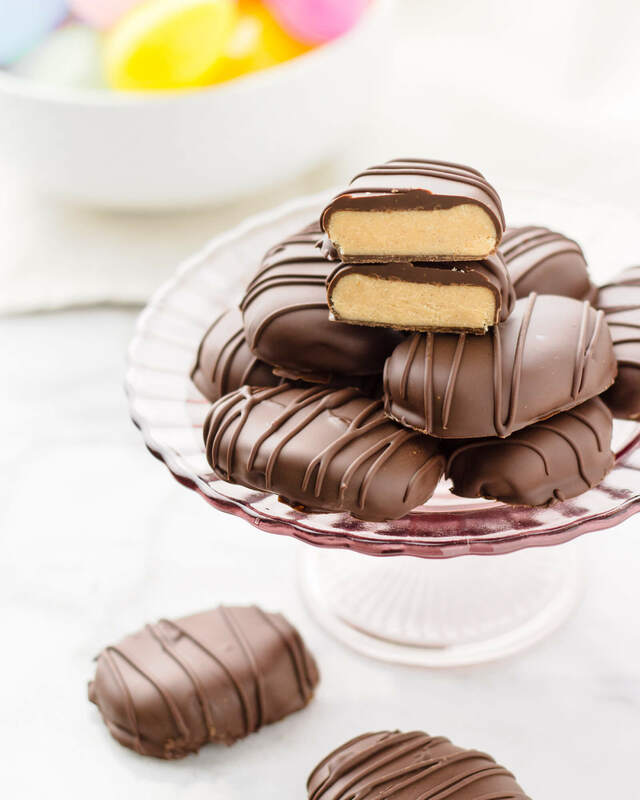 Making healthier chocolate covered peanut butter eggs is so easy and delicious with this recipe. What Makes These The Best Copycat Reese’s Peanut Butter Eggs? This recipe contains NO coconut flour and NO ground peanut powder. I’ve found that coconut flour and unsweetened peanut powder give no-bake recipes a gritty texture and a strange flavor. Not the smooth, creamy consistency I’m going for. My peanut butter filling is based on a recipe I learned to make as a young pastry cook. Except that I no longer have a copy of the recipe, and the original definitely wasn’t low carb friendly! So I had to put on my keto baker thinking cap and cobble together bits and pieces to create the recipe below. 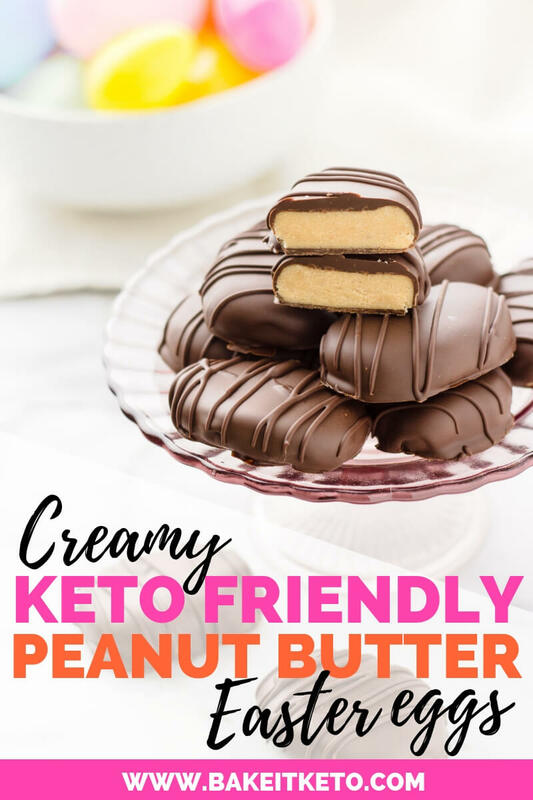 The end result is creamy, healthy keto copycat peanut butter eggs. Perfect for a sugar-free Easter treat! Each Reese’s Peanut Butter Egg (the classic, milk chocolate covered version sold in the yellow wrapper) contains 18 grams of carbs, 16 grams of sugar, 10 grams of fat, 4 grams of protein, and 170 calories. That is more carbs than I eat in an entire meal, not to mention that most of the carbs are coming from sugar! As a Type 1 diabetic, all that sugar would really spike my blood sugar and make me feel terrible. And according to Reese’s own allergen information, the chocolate covered peanut butter treats in seasonal shapes aren’t gluten-free. So if you have a celiac diagnosis (or maybe gluten just plain makes you feel awful), you’ll definitely want to make a healthy homemade alternative. These homemade low carb peanut butter eggs each contain just 3.9 grams of carbs – so much easier on my blood sugar! To make these peanut butter eggs nut free, simply substitute sunflower seed butter in place of the peanut butter. Always be careful to check labels! Many sunflower seed butters contain added sugars and oils. I recommend this unsweetened sunflower seed butter. Other nut-free options are pumpkin seed butter or 5 Seed Butter. This recipe will also work well with other popular nut butters, like almond, cashew, or macadamia. So if you can’t do peanuts, but you’re ok with another type of nut, go ahead and use what works best for you. It’s so easy to make this recipe vegan! Simply substitute coconut milk powder in place of the heavy cream powder. I like this coconut milk powder because it’s 100% dried coconut meat, with absolutely no fillers or additives. And despite its name, cocoa butter is a non-dairy product, so there’s no need to find a substitution for it. Cocoa butter is just the fat that comes from cocoa beans. Not only are KNOW Foods chocolate chips sugar-free, they’re also dairy free. Start by freezing your peanut butter eggs: Freezing the egg-shaped filling will make the dipping process faster, easier, and neater. Plus, the chocolate coating will set faster! Make the dipping chocolate: Melt together the KNOW foods sugar-free chocolate chips and the Spectrum organic shortening or coconut oil. Dip the eggs: Using two dinner forks, dip the peanut butter egg filling in the dipping chocolate, scoop it out, and let the excess chocolate drip off for a few seconds. Let the chocolate coating harden: Use one fork to slide the chocolate covered egg off of the other fork and onto a parchment or silicone baking mat lined cookie sheet. Allow the chocolate coating to set at room temperature. Add coconut oil or organic shortening to the chocolate. To get that perfect, ever-so-slightly-softer texture. DIY dipping chocolate gives you a peanut butter egg coating that is completely solid at room temperature, but still easy to bite. In my opinion, that slight difference makes it more like the real thing. To get a nicer finish. Chocolate that’s out of temper will leave your candy with a dull, and sometimes even crumbly coating. DIY dipping chocolate is a super easy alternative. Note: Don’t substitute cocoa butter in place of the coconut oil or organic shortening. Cocoa butter is actually the reason we temper chocolate. It’s the fat from the cocoa bean, and tempering is our way of forcing those fatty acids to crystallize in a nice, organized fashion. So while pastry chefs sometimes use additional cocoa butter to thin the melted chocolate, it still requires tempering for the best results. It’s not necessary, and it tends to create more of a mess. Simply use two dinner forks to dip the peanut butter eggs and scoop them back up. Let the excess chocolate drain off, and then use one of the forks to push the egg onto the prepared cookie sheet lined with parchment paper or a silicone baking mat. Want to step it up a notch? Try a set of candy dipping tools like these. And these silicone baking mats are an amazing deal. This recipe is great for more than just peanut butter Easter eggs, of course. The easiest way to make more intricate shaped peanut butter treats is to use a cookie cutter. PSST – The best way to grab cookie cutters for every season is to buy a set like this. These cookie cutters are made in America of heavy duty tin plated steel and tested for food safety. Simply spread the warm peanut butter filling into a parchment lined 8×8 pan and allow it to set for approximately an hour in the refrigerator. Use the parchment paper to lift the firm filling out of the pan. Then just cut out the shapes you want using a cookie cutter. You can soften the leftover scraps in your hand and shape them using one of your cookie cutters too. And don’t worry, someone has already done the hard work of figuring out which shape gives you the highest peanut butter to chocolate ratio. Want the TL;DM version (too long, didn’t make)? I get it, sometimes you just want allll of the peanut butter and chocolate without any fuss. Or cute shapes. No problem. Just pour the peanut butter filling into an 8×8 pan lined with parchment paper and spread it out to fill the pan. Now pop the pan in the freezer while you make the dipping chocolate. Half of the dipping chocolate recipe will be enough for this method, so I recommend using just 3/4 cup of KNOW Foods chocolate chips and 1 Tbsp of Spectrum organic shortening or coconut oil. Once the dipping chocolate is all melted and well mixed, just spread it evenly over the peanut butter filling in the 8×8 pan. Pop the pan back in the fridge or freezer for around 30 minutes. 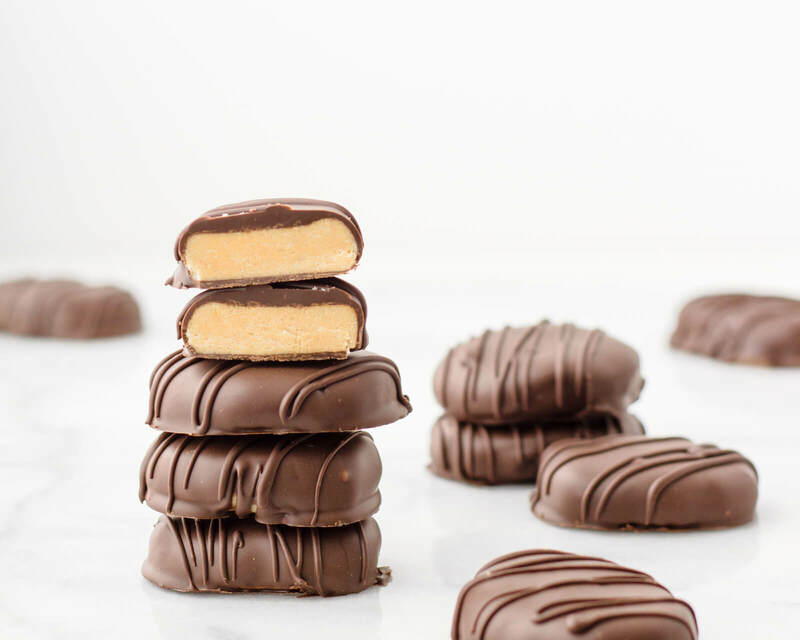 After everything is cool and firm, use the parchment to pop your peanut butter chocolate candy out of the pan and cut it into 12-16 pieces using a large chef’s knife. Easy and healthy copycat peanut butter eggs that are gluten free, low carb, and sugar free. With nut free and vegan options. To the bowl of a food processor, add the allulose and pulse until it reaches the consistency of confectioners sugar. Add the heavy cream powder, peanut butter, salt, and vanilla to the food processor and pulse until it reaches a sandy consistency. Add the melted cocoa butter and run the food processor until the filling comes together to create a smooth and thick peanut butter filling. The filling will still be warm from the cocoa butter, making it too soft to work with. Put the peanut butter filling in the refrigerator for 30 minutes to cool. Using a portion scoop, form the peanut butter filling into 12 balls and place them onto a cookie sheet lined with parchment paper or a silicone baking mat. If your filling got too cold and firm in the refrigerator, simply let it sit at room temperature for a few minutes or warm the filling in your hands as you form the egg shape. Chill the eggs in the freezer for 15-30 minutes (this will make dipping easier). To a medium microwave-safe bowl, add the KNOW Foods chocolate chips and the Spectrum organic shortening (or coconut oil). Microwave in 20-30 second intervals, stirring well at each break, until melted. Remove the peanut butter eggs from the freezer and dip them, one at a time, in the chocolate mixture. Using two dinner forks, dip each peanut butter egg in the chocolate mixture and scoop it back up. Let the excess chocolate drain off, and then use one of the forks to push the egg onto the prepared cookie sheet lined with parchment paper or a silicone baking mat. Let the chocolate coating set for 15-30 minutes (or pop the eggs in the freezer to set the coating faster). Optionally, put the leftover dipping chocolate in a pastry bag (or use a plastic zip-top bag with the corner cut off) to decorate the eggs as shown. Store the peanut butter eggs in an airtight container. Nut-free option: In place of the peanut butter, substitute unsweetened sunflower seed butter (I like this one) or unsweetened 5 Seed Butter. Vegan Option: In place of the heavy cream powder, substitute unsweetened powdered coconut milk (I like this additive free one). Please note that cocoa butter is a non-dairy product, and that KNOW Foods chocolate chips are dairy free. Please note that the nutritional information for this recipe is calculated assuming 1/4 of the dipping chocolate will be leftover when you're finished. 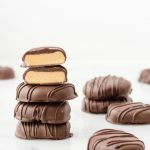 WANT TO SAVE THIS HEALTHIER KETO PEANUT BUTTER EASTER EGGS RECIPE FOR LATER? CLICK HERE TO PIN THIS TO YOUR FAVORITE LOW CARB PINTEREST BOARD!